There are some things in life that are not much fun but must be done. That's what I tell my kids. One of those non-fun necessities in the life of a child is memorizing the multiplication table. Yes, you can skip count, but future math problems will be so much easier if the answers to multiplication problems are readily available. While I was dragging my son through his latest set of flashcards and wondering if we would ever get through them, I had a bit of inspiration on how to make them more fun. 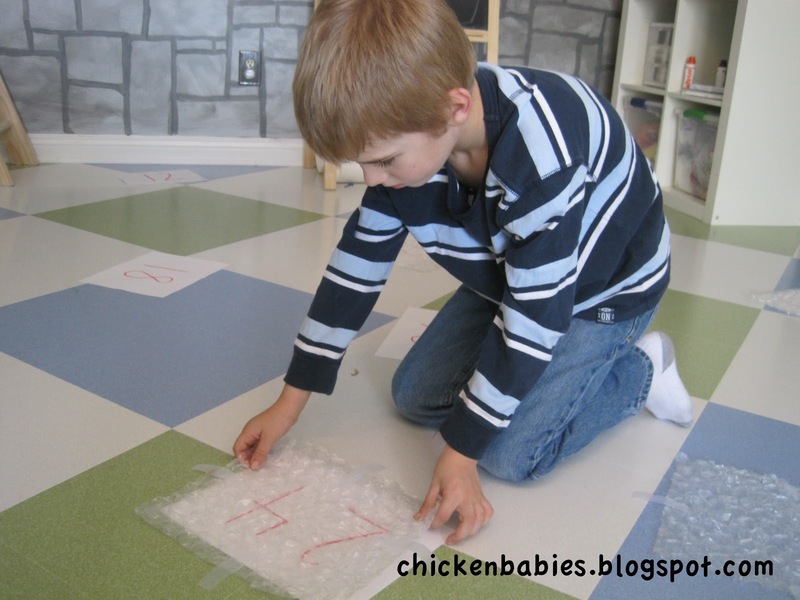 I had seen an idea on Pinterest from giverslog.com where they had made a bubble wrap hopscotch gift to send in the mail. I thought, "How fun! 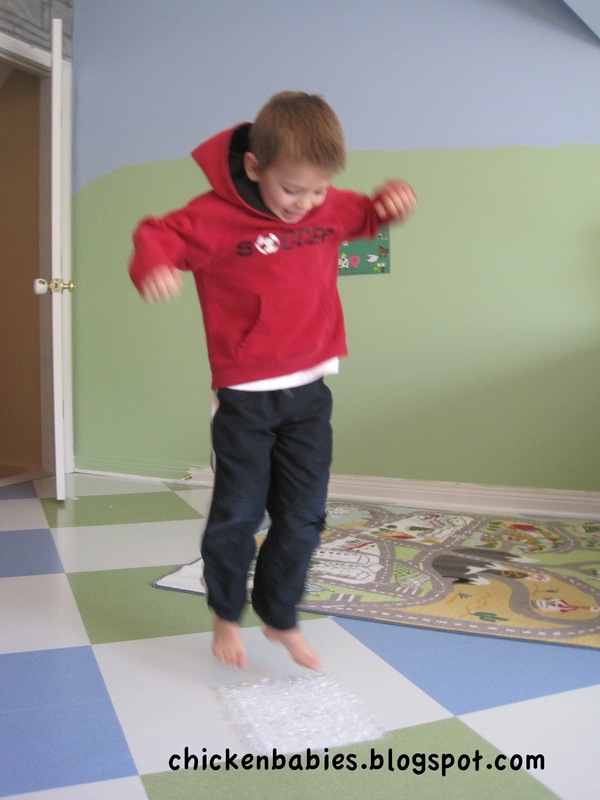 What kid doesn't like jumping on bubble wrap?" This came to mind as I was puzzling over how to make our drill work more fun, and I thought "I should put the answers under bubble wrap and have him jump on the right one!" It was a hit. I cut squares of bubble wrap (I used the large bubbled kind because it makes a louder "pop") and wrote the answers to some of the multiplication problems we were practicing on pieces of paper. 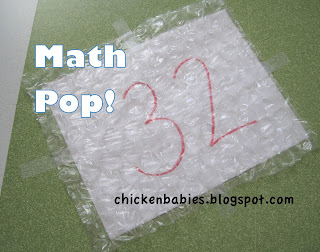 I scattered the answers around the room and taped down a piece of bubble wrap on top of them. After I explained the game to him, we practiced the flash cards one time so they would be fresh in his mind. I called out multiplication problems, he called out the answer, found it on the floor, and jumped on it. The next time through we used a timer to see how fast he could do it. Then we did it again to see if he could beat his time - much more fun than sitting still and drilling. He thought we should call the game "math pop", so we did. We made up our own rules. After he yelled out the answer, I was supposed to yell "pop it!" and he would go jump on it. I was not supposed to say the next problem until I heard a good 'pop'. Games you make up together are always more fun. With the toddler, I put colored pieces of construction paper under the bubble wrap and told him jump on the color I yelled out. He said "No mommy. I stomp!" Okay. That works too. After he stomped for a while, he decided it would be more fun to run and jump. 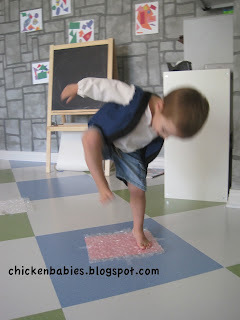 He did slip a few times when he started that, because the bubble wrap can slip even when taped down, but he would just stand up and laugh and say "I okay, mommy. I okay." The older kids didn't have a problem though. For the 5 year old who is learning to read, I wrote letters on paper to put under the bubble wrap. I would say something like "what letter does the word 'ball' start with?" and he would say "B! ", find the letter, and pop it. This idea can be modified for so many different subjects. What about writing out the continents, saying a country, and having the child jump on the continent where you would find that country? You could play this game to practice letter recognition, sight words, number recognition, math computation, states and capitals, musical terms, and any other thing your child needs to work on. 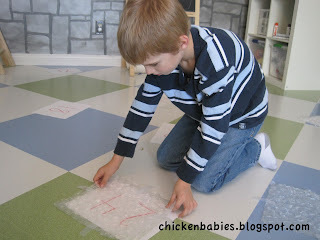 We had scattered the answers all around the room so there would be lots of moving (kids just need to move, don't they? ), but you could also play with the answers all in a row or in a square to make it easier for the kids to find the answers at first. When they were more familiar with the answers you could spread them out a bit more. If you have more than one child working on the same things, you can always make it competitive and see who can pop the answer first. Or you can split into teams and have one child from each team be racing to pop the answer first. Just some thoughts. My kids really enjoy playing this game during school time. When we're done, we just stack the bubble wrap in a pile to use another day. So, there you go. Next time you have some flashcards to do with your child, think about adding a little fun to it. Phew. That was a long post. I need a nap. I love it! I would want to join in too because I can't help popping those things. I am stopping by from For the Kids Friday and am a new follower. Hope to you at True Aim! Thanks for following! I joined your site too! Thanks so much! We have fun with it. See?! You are way more fun than me. I just send them to the iPad for the OTHER Pop Math. oh my goodness, this is completely brilliant! talk about sensory learning : ) What a simple and completely awesome experience for the kids. and thanks so much for the shout out! Hello! Just stopping by from flock together tuesday blog hop! I am now a follower! Would love to have you stop by! What fun!! I'm pinning this so I can remember to try this out with my 3-year-old. He would LOVE this game. (Oh, and I'm loving the flooring in that room... is it your school room?). Stopping by from Tuesday Tots! Thanks for stopping by! Yes, it's my school room floor. We love it.